Long, Duncan. 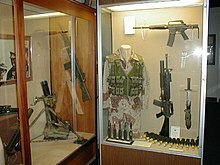 The Complete AR-15/M16 Source-book. Boulder, CO: Paladin Press, 2001. ISBN 0-87364-687-8. United States, Headquarters, Department of the Army. TM 9-1005-309-10, Operator's Manual, Sub-machine Gun, 5.56mm: Port, Firing, M231. Washington, DC: Headquarters, Department of the Army, 1997.